This card was made with a selection of 2cm strips of the Wild Rose - Lilac Mist papers. The papers were edged with glitter glue and then attached to basic white 6 x6 card stock. A selection of coordinating Bee Crafty blooms were then used to make 3 floral embellishments. 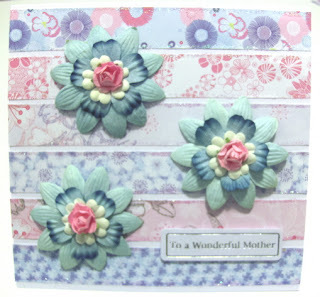 Think this makes a really pretty mothers day card.